Started in 2000 by Adventure Books staff members Robert Blevins and Gayla Prociv, B and G Housecleaning is a premier cleaning service based in the Puget Sound area. (the picture on the right is from 2003, taken on the day we formed Adventure Books of Seattle) We offer full home cleanings in the South King County area of Washington State. We do cleanings in the 'presentation method,' which means we start high and work to the floor, using only the best products. Rest assured that unlike some other cleaning services, we can be trusted in your home. Some customers have been with us for more than a decade, and this is a testimonial to the exceptional work we offer. Service is offered on a monthly basis only, (every 28 days, same day of the week, 13 times a year) or by special arrangement for 'One-Time-Only' cleanings. 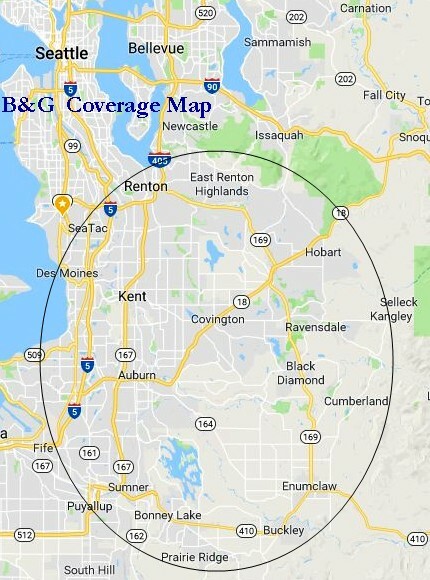 Our main territory runs from Renton, WA in the north, to Sumner, WA in the south King area of Washington. We are based in the city of Auburn, Washington State, USA. To download our four-page PDF 'Information for New Customers,' just click HERE. To contact us by email for service inquiries and current rates click HERE. To see our current Coverage Map to find out if we offer service in your area, click HERE.